Lens F. Zuiko 35 mm f/2.8. 6 elements in 5 groups. Shutter Electronically controlled leaf shutter, ca. 10 sec. to 1/500. No "B". Self timer. Light meter CdS-cell above the lens. Aperture priority AE only. Exp.-correction +1.5 EV with switch on camera bottom. 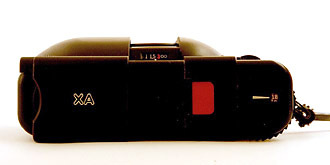 Film speed 25 to 800 ASA. Focusing Coupled Rangefinder (Yes! ), close focus 0.85m. Viewfinder Brightframe with diplay of automatically selected shutter speed. Flash Connection for dedicated A11 und A16. Automatic flash contol (light sensor, non TTL) or full power. Film transport Back door loading. Thumbwheel. Rewind crank. Heard a lot about it, hesitated for a long time, eventually bought it, and am now enthralled! Probably the smallest 35mm rangefinder camera. Also fitted with an array of rare features that simply make it one of a kind. A camera that you can always take with you effortlessly, and that takes awesome pictures to boot. The XA is the definitive street shooter: firstly nobody notices it, secondly, when people notice it, they hardly take it seriously. Finally it's small, black and incredibly silent. I've been asked a couple of times about its number of megapixels (correct answer: around 20, depending on the scanner), which points to the fact that either the design is timeless, or maybe just as bollixed as that of many digital cameras. My vote goes to timelessness. Despite the camera being composed for a large part of plastic, it makes a sturdy impression. Even in rough daily use there's no obvious wobbliness, and this kind sir is nonetheless over twenty years old. My first one, though, died electronically when i fell from a scaffolding this year in january (and tore my achilles tendon). I just had to get another one. 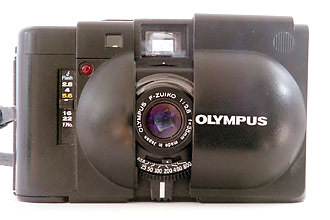 The sliding lens cover (or "dust barrier" in Olympus wording") protects the glass and the whole camera from dust, dirt and other dangers, switches off the exposure meter when closed, and blocks the shutter release. The XA is the only camera that I dare to drop into my usually untidy coat pockets without hesitation. 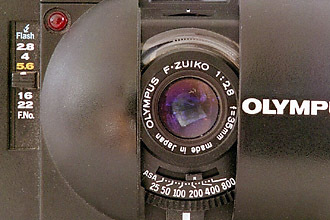 The F.Zuiko lens is of course a very special construction with shortened length and a comparatively giant rear element. The letter F points to a six-element design. If you realise that this construction must have required some compromise or another, you can only applaud the image quality. Even under objective standards there's only a slight loss of sharpness at full opening. At f/2.8 and 4 there's also a slight tendency towards vignetting. Aperture automatics means being in control over depth-of-field. 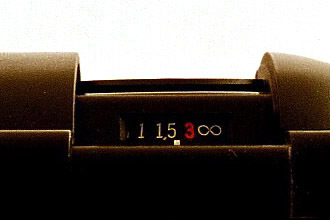 Times up to 10 seconds are chosen. Marvellous in dusk or closed spaces without flash. In delicate situations the self-timer beep can be a hindrance, sure to trigger some museum guard or another … A miniature tripod with flexible legs is sufficient for this camera and fits in your trouser pockets if it has to. 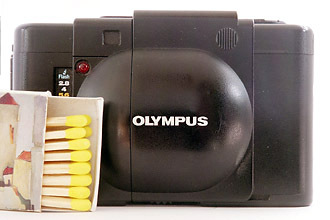 The viewfinder is big and bright, the rangefinder easy to operate in bad light conditions. However, the brightline isn't completely visible to people with glasses. And the viewfinder has a fairly strong barrel distortion, which has begun to annoy me. Super light shutter release of conductive polymer to avoid any vibration. Indeed the release is so smooth that "it" sometimes occurs too early by accident. Combined lever on the bottom for backlight correction (+1.5 stops), battery control and self-timer. 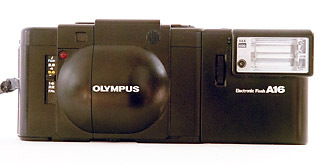 The XA system flashes A11 and A16 are perhaps a bit large in relation to the camera. "Normal" flashes don't fit, because the camera has neither a flash shoe nor an X contact. But the system flashes are very nice and hand an automatic aperture that sets itself when the camera is switched to flash mode (around f/3.5 is my guess). The automatics only work with 100 and 400 ASA, at other values only the good old guide number system provides solace. With negative film you could try to use the automatic settings for 200 and 800 ASA films too, for Kodachrome 200 I set the flash to 400, and that works fine (in my opinion. But I hardly ever flash). A disadvantage is the missing filter thread. Though you can improvise by holding filters in front of the lens with your free hand, it looks, well, unprofessional and is impractical. On the other hand, you don't need a filter as a lens protector, and polarizers aren't very at home on rangefinders. Not a disadvantage is the missing thumb wind. The XA has the most ergonomic thumbweel that I know of. If you find this website helpful or just nice to have around, you can support it by making a donation through PayPal.